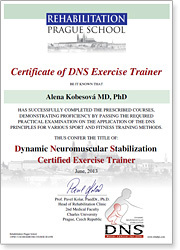 DNS Certified Exercise Trainers are Health, Fitness, and Sport Professionals who have satisfactorily completed the required DNS Exercise Training coursework consisting of DNS Exercise Courses I, II and III. They have passed the practical testing associated with their training, and have demonstrated competency in both knowledge and skill execution in the application of the DNS Exercise assessment & training principles. They have earned the title "Certified DNS Exercise Trainer" (DNSET) issued by the Prague School of Rehabilitation, Prague, Czech Republic.